Pacific Curator Sean Mallon asks Tokelauan Kevin Sesale Setefano from Mafutaga Tupulaga Tokelau Porirua, to recount his memories of a photograph taken in 1986 that relates to one of Te Papa’s collections. Today, I want to share with you a photograph. I recalled spotting it on a friend’s Facebook several months ago. So I invited Kevin Sesale Setefano to share his memories of the photograph as it relates to this small collection presented to the museum in 1986. My thanks to Kevin Sesale Setefano for sharing the photograph and the words below. Faka fetai! 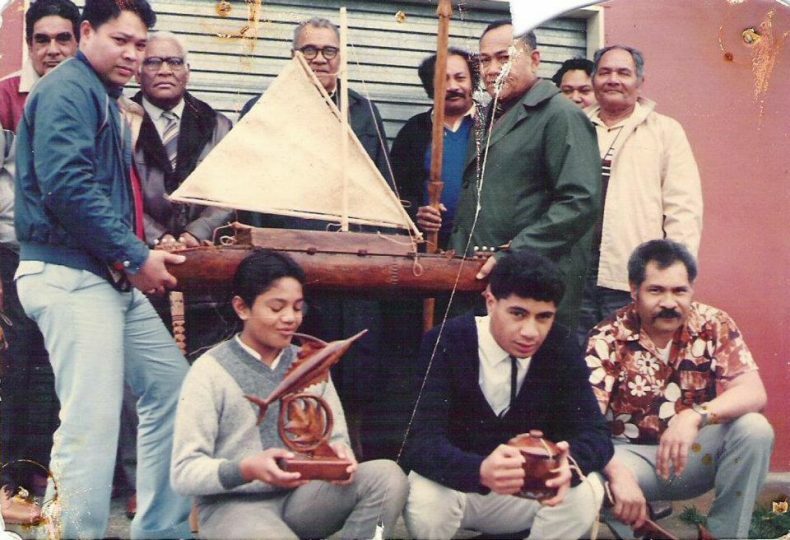 Kevin: This is a photo taken at the Iulio and Silila Setefano family home in Warspite Avenue, Porirua, back in 1986 where a Tokelau project workshop programme was held over the duration of a month. The Tokelau government funded an arts and crafts project development by Alepano Savelio involving the Tokelau traditional craftsmen shown in the photo. This was to be displayed in the National Museum, which was on Buckle St, Wellington at the time. It was the first display of Tokelau crafts to be done there and ceremonies took place. The elder craftsmen from Atafu, Nukunonu and Fakaofo Tui Tokelau are very unique, and range in their styles and techniques. They make the treasures and survival tools that have been taught over many generations in Tokelau and that continue to this day, so we can teach our young people in New Zealand the crafts for their journeys and pathways to come. As the young people in the photo, Savelio Ioane and myself (Kevin Sesale Setefano) we were helping and supporting the elders with the traditional project. For us, it was about active listening and the importance of understanding workmanship, understanding how Tokelau tools can keep us alive. These were important survival skills in order for our kaiga (family) to support themselves through daily living in Tokelau. The project was very interesting and at times entertaining. As the elders told their stories and worked on the crafts, they had hilarious discussions between themselves as they shared their versions of the Tokelau culture with each other. Tokelau arts and crafts will continue on if the traditional workmanship and skill sets are passed on to younger generations. Tokelauans’ have moved around the world and have needed to learn other skills and undertake education to survive in the European world. However, the knowledge and education that I received will never be forgotten and will be passed down to next generation to carry on.